KRASNAYA POLYANA, Russia (AP) - Shaun White took 10 practice runs down the halfpipe on a windless, sunny morning in the mountains above Sochi and let out a big "whoooo-hooo" when the last one was over. Yes, he says, this is where he belongs. In his first interview since announcing he was skipping the Olympic slopestyle contest, White told The Associated Press he is at peace with his decision to focus solely on the event where he's won two straight gold medals and will go for a third on Tuesday. "I can understand if it's your first time to the Olympics, you wouldn't understand a decision like the one I made," he said Saturday. "But you set your goals according to what's important to you. Halfpipe is important to me and I didn't want to jeopardize that." White withdrew from the Olympic debut of slopestyle after a couple of rugged days of practice that left him with a jammed wrist. He called the course "intimidating." 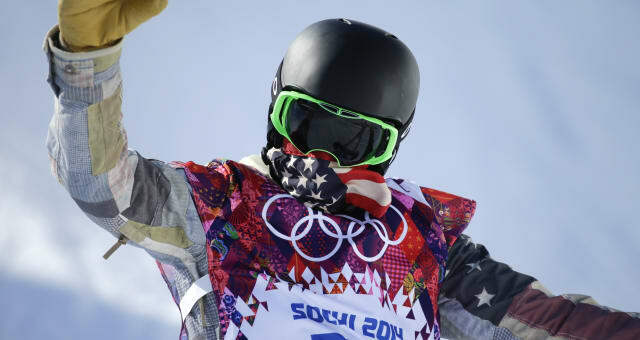 With input from the riders, the course was made significantly tamer by the final, where another American, Sage Kotsenburg, won the first gold medal of the games about an hour after White's session was over. No regrets, says White, who will leave the Sochi Games the most famous name in his sport regardless of what happens on the halfpipe. He knows, however, that doubling down there adds a significant amount of pressure. He's trying to become the first American male to win three straight golds at the Winter Olympics. "I'm OK with that," he said. "It keeps me going, keeps me progressing, keeps me guessing. And I'm hoping to have a great Olympics. I'm feeling very, very confident and healthy, which is nice." White went through a grueling winter of qualifying for the Olympics. He hurt his ankle on the halfpipe and his shoulder on the slopestyle course. He didn't try any of his most difficult tricks during the training session. This was the first day of training and the kinks are still being worked out on a halfpipe he called "interesting." When he announced he was pulling out, the 27-year-old megastar said riding the treacherous course wasn't worth risking an injury that could put a damper on his chance for a three-peat. Canadian snowboarder Sebastien Toutant was among the many who took to social media and accused White of ducking the competition because he knew he couldn't win. Others blamed White for costing another American a spot on the U.S. snowboarding team. His coach, Bud Keene, said "I'd like all the haters to turn into lovers but that's not my job." "I totally supported his call," Keene said. "It's never a good idea for any of these athletes to go out there when they're not feeling 100 percent about what they're doing. Because these are big features, this is icy snow and there is real danger in what he does. So, you've got to go with your gut." White's gut tells him he's doing the right thing. "It's a tough decision to make, just like anything at the Olympics. It's always, like, everything's on the line," he said. "I wanted to be here and wanted to compete in both events. But it just wasn't in the cards."